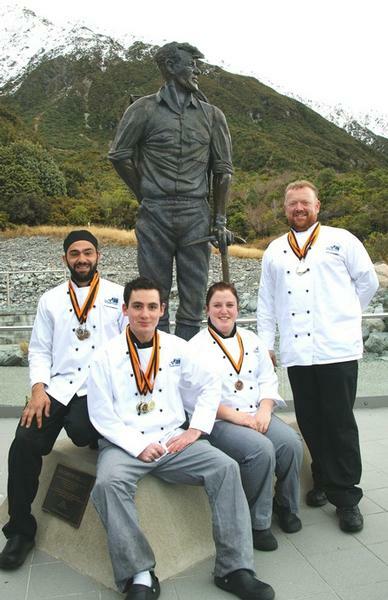 The Hermitage Hotel at Aoraki Mt Cook is celebrating the success of its award-winning chef brigade following the Southern Light Salon Culinaire competition last weekend. Guided by hotel Executive Chef Ken O’Connell, the kitchen team competed at the event held at the Southern Institute of Technology (SIT) in Invercargill. Chef O’Connell said he was “extremely proud” of his team’s performance. “I’ve always competed in culinary events throughout my career and I think it’s a great thing for any young chef to experience,” he said. “Competitions refine skills and discipline, and instil pride and work ethic in young chefs. The Salon Culinaire competition was for students or chefs already working in the industry. Entrants competed in categories including preparation and cooking of food, barista skills, table setting and beverage services. Taking out the overall Southern Light Training Chef award was The Hermitage’s Chris Walker, who also who won three individual events including salmon, dessert and ‘hot main presented cold’. Also from The Hermitage, Kane Bambery won the title Southern Light Open Chef, winning three individual events including beef, seafood mystery box and hot main presented cold. Ashley Baty won silver and two bronze awards in salmon, pastry and ‘hot main presented cold’. Chef O’Connell also won Gold for his hot main presented cold dish and two silvers in cold display desserts. “I entered as a training exercise for myself, and to show the team how to do it and what it takes,” said Chef O’Connell. He said his team worked hard in the lead up to the competition and deserved their recognition. “The event was held over one day, but we worked through the night for 14 hours to do all of our cold static plates,” he said. Chef O'Connell has previously competed in the Culinary Olympics in Germany and the Culinary World Cup in Luxemburg. “I won New Zealand Chef of the Year in 2008 which personally gave me the drive and incentive to train and develop my young chefs,” he said. Chef O’Connell said he was working hard to get his team of chefs to the National Culinary Show in Auckland in August this year and would be sourcing sponsorship to help get them there. Visitors to The Hermitage Hotel Aoraki/Mt Cook can experience the culinary delights of Chef O’Connell’s award-winning team at The Hermitage Panorama Room Restaurant.